Last week we reviewed Lightroom's Import Module and how it can help automate getting your images from your memory card onto your computer. So now what do you do with the 400+ images you just imported? You leverage the power of the Library module to determine who gets to stay and who gets "voted off". Before we dive into the tools, it would probably be helpful for you to understand a little about how I shoot and what my philosophy is with regards to "keepers" as this is something you're going to have to decide for yourself as well. Generally my photography shoots fall into one of two categories - family photos and everything else. For me, family photos typically center around capturing events and memorable moments that we'll keep forever. As such, I'm much more lenient as to what constitutes a "keeper" and usually only purge the duplicates or those that are obviously beyond saving. When it comes to "everything else", however, my goal is pretty simple - slash and burn. If I wouldn't print it and hang it on a wall or buy it for use as a stock image, it's gone! If you're the "picture pack rat" type, you're probably huddling in the corner right now :). Again, this is my philosophy and it doesn't have to be yours. I personally just don't see the benefit of sucking up valuable hard drive space with thousands of images I'll never do anything with. It's common practice for me to take a set of 400+ images and par it down to 12 or 15. 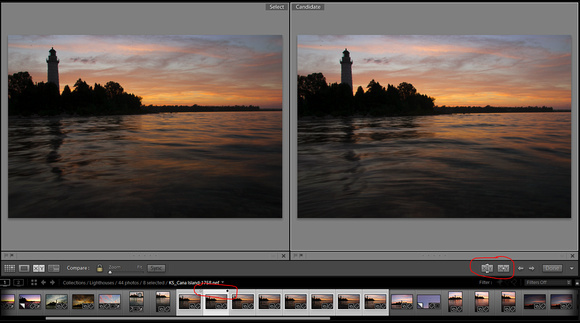 Now that you can understand the methods of my madness, let's see how Lightroom can help. My process usually involves two, maybe three, passes through the images found in the "Previous Import" folder under "Catalog" in the Library Module. In the first pass, I'm "dumping the duds" - those images you know have no hope whatsoever. This is my process for Pass #1. Select the first image in the set and press the "E" key on your keyboard to enter "Loupe View"
If the image on screen is "garbage", press Ctrl + Down Arrow to mark it as a "Reject". Press the Right Arrow key to advance to the next image in the filmstrim. You can use the Spacebar to quickly zoom in on the image to check for sharpness. Press the Spacebar again to zoom out. Repeat steps #4 and #5 until you've cycled through every image in the import. Press Cltrl+Backspace. This will do two things. First, it will filter your view to show all images you've marked as "Rejects" and then display a confirmation box requesting whether to "Remove" or "Delete from Disk". For me, it's "Delete from Disk"... duds have bee dumped. Repeat steps #1 through #3 above to make sure you can see a nice big image along with your filmstrip. Scan through the filmstrip to find "like images" of which you're goal is to select the best image of the series. Select the first "like" image in the filmstrip so it's visible in the "Loupe View"
If images in the series are all adjacent to one another in the filmstrip, hold down the Shift key and click the last of the similar images in the filmstrip. This select the first and last images and everything in between. If the images in the series are NOT adjacent use Ctrl + Click to select only the images you'd like to compare against one another. In this view, you'll see I have 8 images selected in the filmstrip. As they are all similar and they made it through Pass #1, my goal is now to identify and keep only the best of those 8 images. At the top of the left hand image, you see the word "Select". This signifies that the image on the left is the "preferred" image. The image on the right, labeled "Candidate" is the "Select Wannabe". You'll also notice a white diamond (Select) on the filmstrip thumbnail and a black diamond (Candidate) to help keep track of which images are currently being viewed. Now you have just one question to answer. Is the image on the right (Candidate) BETTER than the image on the left (Select)? If the answer is no, click on the image on the right and press Ctrl + Down Arrow to mark it as a reject. If the answer is yes, press the "Make Select" button to move the Candidate to the Select position. See the red circle beneath the Candidate image? The "Make Select" button is the button on the right inside that circle. Press the Right Arrow button to load the next filmstrip image into the "Candidate" position. Repeat steps #5 and #6 until you've compared each similar image and have only one "non-reject" remaining. Click "Done" to exit compare mode. When you reach the end of the filmstrip, Ctrl + Backspace to delete all of the "Rejects"
What's left should be "The KEEPERS"! There's no law that says you still can't dump a few more if you change your mind. Just remember to use Ctrl + Down Arrow to set an image as a reject and the Right (or Left) Arrow to navigate through the filmstrip. There are a bunch of other options within Lightroom to further categorize the "quality" of the images if you so choose. For example, you can make an image a 1, 2, 3, 4, or 5 star image. What's a 3 versus a 4 or a 5? I have no idea which is I rarely use this option. But then again, I'm the "slash and burn" type. If I didn't think it was a good enough image, it would have been "dumped with the duds". That's all for this week. Next week we'll look into how to use collections to organize your "keepers" inside Lightroom.